Audio Spillage’s Drum Spillage 2 is the (surprise!) second version of their Audio Units-format synthetic percussion plug-in for Mac OS X. Where it differs from the Steven Slate Drums of this world is in its proud emphasis on synthesized drum sounds. If you’re after a vintage Linn, DMX or other sample-based beat machine, this is not the droid you’re looking for. But if, like me, you miss Waldorf’s Attack and you like to roll your own sounds, Drum Spillage 2 is definitely of interest. Remember, too, that a fair number of classic drum machines, like the TR808 and CR78, used totally synthesized sounds. Perhaps a drum synthesizer, albeit running as software rather than an unruly clump of wires, gets closer to the spirit of these machines than static samples? The first thing that made me smile about Drum Spillage 2 is its aesthetic. Like Apple with iOS 7, Audio Spillage have eschewed the dreaded skeuomorphic design that infects many plug-ins, and instead, present the user with a beautifully spartan and utilitarian graphical interface. There are 16 pads arranged in a four-by-four grid. Hit some keys from C1 upwards and waveforms pop up on the corresponding pad. It’s a wonderfully simple way of connecting real-world controller with virtual response, and it makes programming Drum Spillage 2 a doddle as you never get lost: you always see what is playing where. Whilst this kind of interface has been done before, Audio Spillage’s implementation is leaner, cleaner and therefore more immediate than others. The second smile was courtesy of the sound. It’s crisp, clean and punchy-sounding, very like something I’d spend hours patching up on my modular only to forget about and ruin the next day. I programmed some beats and was impressed by the contrast between the traditional synthesized kicks and snares and the crazier gibberings of some of the pads. Cycling through the factory banks reveals all manner of zinging, whooping and metal-bashing. Drum Spillage 2 arrives with 15 of these factory banks, which are both eminently musical and experimental. ‘Electro’ is the most ‘normal’ of the kits, coming closest to 808 territory. However, even here, the programmers throw us some beautifully mournful percussive tones that sound like goats lost in Scottish fog. A lot of the kits seem to revel in wildly bizarre tones that leap out of the speakers, but they are always part of an ensemble which features usable bread-and-butter sounds too. Audio Spillage are to be commended on their balance here: too wacky and Drum Spillage 2 would be left languishing, never a go-to plug-in; too staid and it would be out-competed by aforementioned sample libraries. The sounds themselves are produced by 12 different synthesis algorithms, and are wonderfully tweakable via each pad’s individual instrument editing screen. Again, Drum Spillage 2’s interface is paramount here: some of the algorithms are quite complex, but at no time did I feel confused or swamped by parameters. Which is handy because even the simplest synth, the cowbell, features four LFOs plus amp and filter envelopes, all of which can modulate each other and some of which are sync’able to host tempo. Each model has a common bottom pane of LFOs, amp and filter section. At the top are individual level and pan controls, along with Crush (sample rate) and Decimate (bit-reduction) controls with which you can turn even the gentlest of sounds into outrageous noise. Lovely. The more complex algorithms such as membrane, noise and FM offer even more possibilities. This makes Drum Spillage 2 tremendously powerful as a soft synth. I would say that even if you’re not in the market for a drum synth, if you’re a synthesis nut you should buy this plug-in just for its sound-design possibilities. As an example, I took the boomy bass drum model, extended the release, modulated it via all four LFOs (each modulated by the successive LFO), passed it through the distortion, modulated the filter with the stepper, sent it through the resonator at really low frequencies and got instant Bebe and Louis Barron. It was pure Krell evil. I headed back to the pad screen and clicked the little keyboard logo to the left of the relevant pad and then the individual pad sound was mapped across my whole keyboard. No keygroups to wrangle with, no squinting and cursing at tiny key numbers — one click and you’re good to go. Since Drum Spillage 2 lets you send 16 individual outs to your host, you can still stick your favourite reverbs or delays on anything you desire. This wonderful tweakability and openness should be a model for all soft synths. 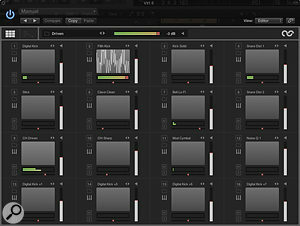 Each pad has its own synthesis screen, so you can tweak individual sounds to your heart’s content. Any gripes I have with this plug-in are petty. Being grumpy and old, I prefer my drum kits mapped in the traditional manner beaten out by our ancestors around MIDI fires way back in the dawn of time. If kick on C1 and snare on D1 was good enough for Homo Erectus, why change it? And where are my goddam hats? Sadly, I can’t moan on for too long because the way you swap or copy sounds in Drum Spillage 2 is ridiculously easy: you just drag and drop. And they give you an MPC pad mode. Dang it. The CPU usage seemed a tad high occasionally, but even if I mashed all the keys down at the same time, I couldn’t provoke any audible glitches. Sometimes when I was trying to adjust modulation via the little pink value strip, I’d click the bigger parameter value next to it. Lastly, I would have liked more factory kits, but 15 isn’t bad. Perhaps Audio Spillage can issue additional kits by celeb synth-botherers? I would love to hear what real patch fanatics could cook up. In a fortnight or so of testing Drum Spillage 2, it hasn’t crashed once or misbehaved itself in any way. The best thing about it is how it actively seduces you away from its own presets — it’s so damn easy to fiddle with. 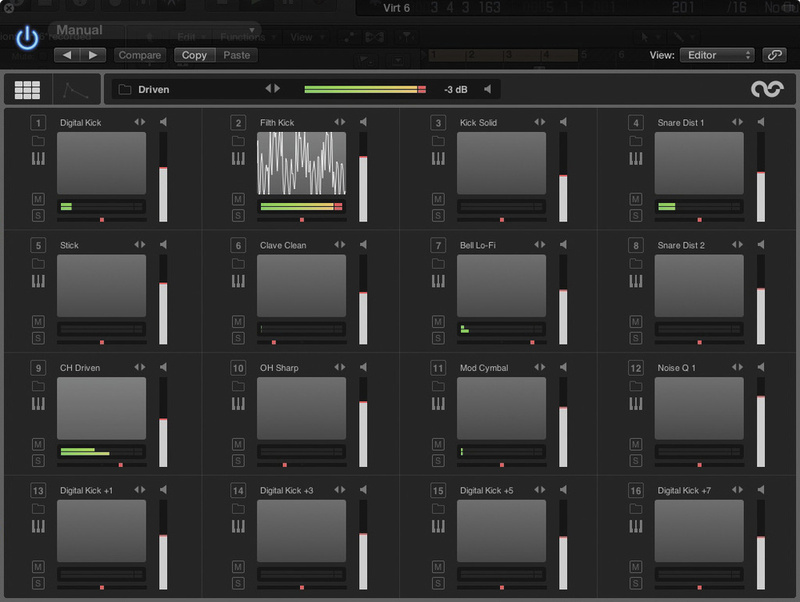 It can deliver rich, evolving complexities that would be impossible from sample-based drum plug-ins. This can be bad because you will inevitably end up falling down a rabbit hole of increasingly insane synthesis, stacking up cross-modulated LFOs willy-nilly simply because you can. The bottom line is this: if you want to escape the same old stock 909 snares and 808 bass drums that clog our airwaves, if you want to actually explore percussive sound synthesis, this is definitely the plug-in for you. Bass Drum: The most 808ish, potentially boomy. Bass Drum 2: Thicker and more thowmping. Snare Drum: The most 808/606ish but very adjustable not to be. Wood Drum: Quite boxy and cardboardy (in a good way). Synth Clap: Very tweakable, I couldn’t quite get my fave 808 sound but very usable. Cow Bell: Works as a cowbell and also a great synth for pseudo-gamelan. Clave: Can be quite piercing. Hi-hat: Can vary from smooth 808ness to grittier, lo-fi fare. Cymbal: Great for any metal-bashing, not just cymbals (try with external gating). Membrane: Reminds me of Logic’s Sculpture a lot. Can do convincing-if-quirky mallets. 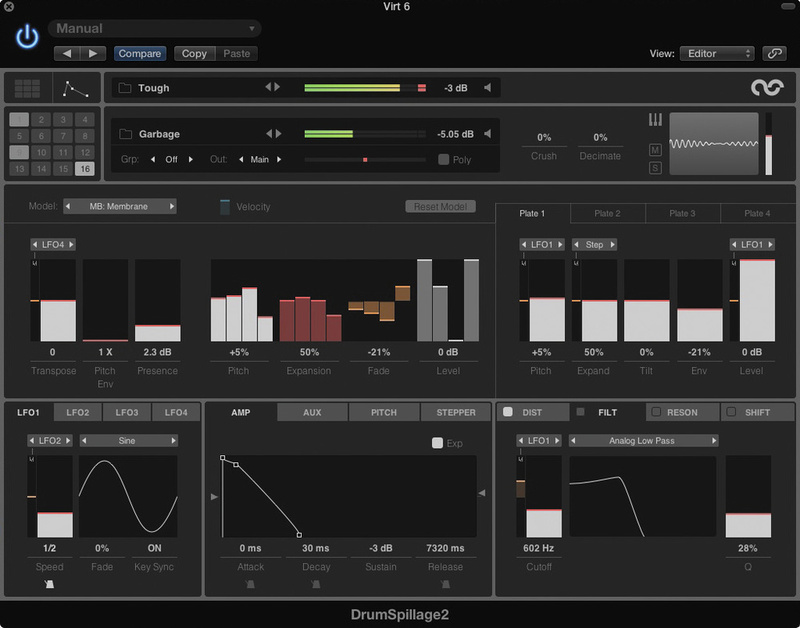 Noise Drum: This actually features four noise sources in one synth and is immense. FM Percussion: All the usual FM madness. Very reasonably priced for what you get. Preset kits come with non-standard mapping. Potential CPU problems in older Macs? Could do with a few more preset kits. 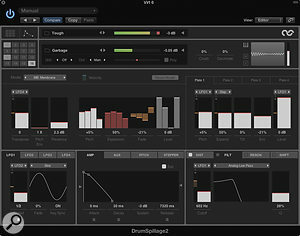 Drum Spillage 2 is an enormously capable and flexible plug-in that doesn’t sacrifice power for ease of use.